Is it just me, or does this have a Larry, Moe and Curly feel to it? I thought $50 would get you the right seat, next to the pilot, license or not. And maybe the opportunity to point out where you want to aim if you're going to pick an alternate landing site or corkscrew in. Have you had a chance to meet Joe Yaiullo? He's the Curator and co-founder of the Long Island Aquarium. He's also a buddy of ours and, for you, a fellow WAMAS speaker. Yes I know him and have king of known him for years. I didn't see him yesterday but I hope to work with him at the aquarium. I should have done this myself because this is what happens when you hire someone. If you want it done right, you should do it yourself. The only reason I didn't do that is that I need two hands to use the saw to cut out my old knee and I also need two hands to put my fingers in my ears because my screaming may scare me. I also would have installed a grease fitting and maybe an adjustment screw. I would have gotten a good American made adjustment screw and not one from Home Depot where their screws come from China and are made out of old I Phone 3s. Ahh man, that is rough. You see these "risk factors" (all procedures) that it only effects x% but it seems like it effects everyone I know LOL. Congratulations! We've all wanted to be a 1%'er! Sorry to hear, Paul. I always think about "Everybody's free to wear sunscreen" when taking about knees. Maybe you heard this playing in a Home Depot in the 90's while you were walking around looking for a barn cat. We are in this new home and our tastes changed a lot since we were young during the Cretaceous period. We always had modern. I wanted my house to look like the StarShip Enterprise. I already look like Capt. Picard so what the heck. But now we are going for more industrial/Steampunk. 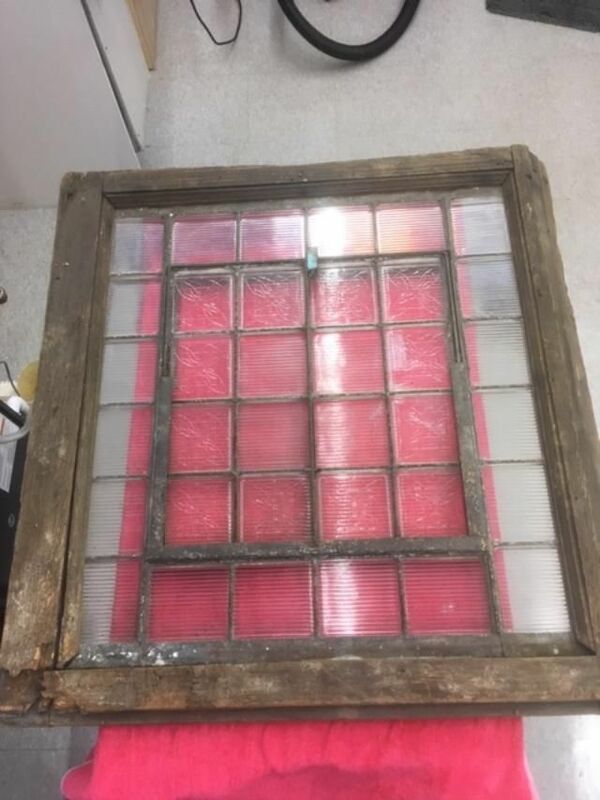 We were looking for an vintage factory window for my wife's bathroom and we just received it. The frame is in very bad shape but I will not replace it as I am looking for that. I need to stabilize it so it doesn't fall apart as it is even hard to pick up because pieces fall off. The wood that doesn't fall off is cracked so much like an alligator that one neighbor ran away as I was carrying it in. It has some design etchings in it and the center pulls open. I will install it in the room with LED strips behind it. I am painging the frame black but I "alligatored" the paint on the frame so it still looks very old. I did some test pieces of wood to see what looks best. I don't want it to look like it was just painted but I also can't use the existing frame color which is sort of like the bottom of Columbus boat. It just doesn't go but they thing should look very cool. This side of the frame is the "Good side"
the Sonny and Cher show. Anyway, as we were watching Siren on TV (very cool show about Mermaids) my wife asked me to put it louder which I did. The over the cabinet LEDs changed from white to blue. I did it again and they went to red. Every time I change the volume on the TV, the light changes color. This is very weird especially because to change the color with the supplied LED remote, you have to aim the thing at the light. But I have to aim the volume adjuster at the TV and the color changes. 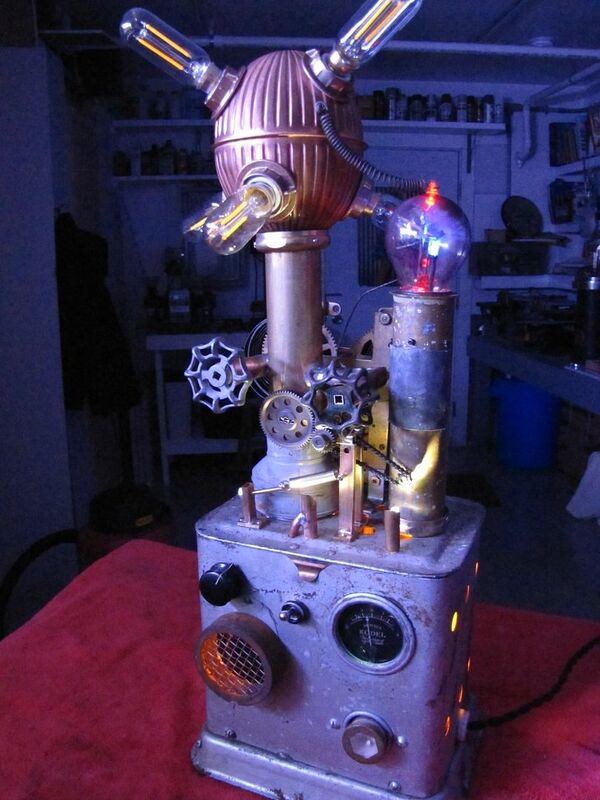 I just finished my new motorized Steam Punk lamp. It has a "fire" inside and when you turn the valve handles, it winds the mechanism on the Grand Fathers clock and spins the gears and tiny bicycle chain for about 5 minutes. The right valve handle moves the gong hammer. It can be dimmed. Haha that's awesome!! Great job! And here I thought you were kidding about steampunk! And yet still bird dog of the 50s in the background. I know so many of those songs because my uncle gave my mom several mix tapes that he compiled of 1958, "the year you were born" for her birthday one year. Those were the soundtrack of our childhood while we built our tree houses out in the desert of Arizona. Before you ask, "What trees? ": mesquite and Palo Verde. Hope your knee is improving. That music in the video was on the radio. I listen to an oldies station. So I went away for 2 days and last night after I came home I found my male Mandarin dead. This is very unusual because I never find a dead fish and my fish don't get sick. I "think" I saw him eating a few days ago but I didn't notice anything weird with him as he was full bodied and smiled a lot. I did notice that he hasn't paid any attention to the really good looking female mandarin in a few months. I also have not used my Mandarin feeder since I moved here 8 months ago because I just have not had time to set up my brine shrimp hatchery. But he was not thin at all so I don't think I needed it and there are bluestripe pipefish and a scooter bleeny that are also fat and fine after a few years. I am not sure how long Mandarins live and I don't remember when I got this one so it could have been ten years or more ago. He outlived two females, one died from being egg bound and I think the other one jumped out. Maybe he broke her heart. I do have a lousy memory and have not kept a log book in decades. He was dead to long to do a necropsy but I am sure it would not show anything. Normally when other fish die of old age, they stop eating for a few days and hide a lot. 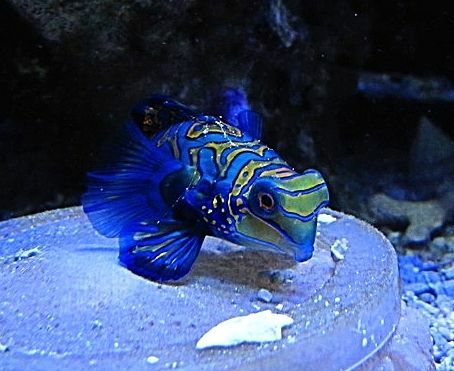 He was not eaten by bristle worms but Mandarins have a thick slime that keeps other fish from eating them and maybe bristle worms don't find them tasty. I have bristle worms that could finish off a halibut in a few hours. Poor guy. He was beautiful. Sorry for your loss. Services will be held at "Mandarins only Chapel " at 8:00am on Sunday. A little while ago I took out my bicycle. I am supposed to ride the thing to exercise the knee, and the rest of me. I used to swim 3 times a week then after a few silly, but manly surgeries I had to give up swimming. Now I can do it again, but it is 20 degrees and my boat is in a snow drift. So I rode the bike for about a mile or so and it was much easier than I thought. Then I noticed it was mostly down hill. Coming back was another story and I was straining to get back. My ears were also getting frostbite. So I was peddling and peddling, working harder and harder and I thought I was going to get a heart attack. If my lips were bigger I would have put them over my nose and given myself CPR. Since my knee operation I haven't exercised to much and I need to get back into shape so I can resume my job as a Male model. If my bicycle would have fit in an ambulance I would have called 911. But I made it back. Sat down and had a nice glass of Grand Marnier and a piece of dark chocolate just for medicinal purposes of course. But, in the end, you made it. Victory! Write again tomorrow, if you can make it to the keyboard. Last night I noticed one of my long growing corals bleached and croaked. Another one has a bleached part so I had to look for a test kit. I found an alk kit but I think it is old because it’s in a wooden box . I used it anyway and the alk is so low that that it is only good for goldfish. I quickly searched through my tank and couldn’t find any goldfish.. OMG. I ran to my favorite LFS. And their goldfish were getting last rites so I figured I had to go with my saltwater stuff. I needed to drastically raise the alk. I had some 2 part stuff and quickly mixed it up. I dumped a bunch in and watched the white cloud spread around the tank. A half an hour later I dumped more in. (I really like to watch that white cloud). I tested the alk. OMG. It only raised it half a point so I dumped in more. Then more. I got the alk up to where I can keep kissing Gouramies. I then had to leave to watch my Grand Kids so I am not sure if my tank will make it to 49 years old. Today I will get home and see what I have. If anything. Apparently the Long Island Sound water is very low in alk so if the tank is still running I should test it next time I change it.